six sizes between 30" and 50"
This one-piece, top-down, “go anywhere” sweater is worked in Stocking stitch with a k1, p1 rib hem. Wear it with jeans or chinos, or dress it up with a white shirt and black pants. The flair starts at the high waist and is created with a 10 stitch left and right slant increase panel down each side of the body towards the hem. 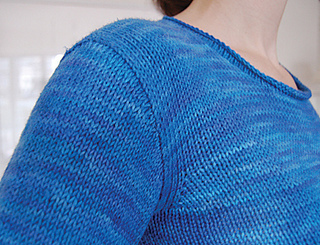 Optional cap shaping at the top of the sleeves is worked with short rows (see photo page 4), giving the shoulders a more tailored look; without short rows this pattern is easy. Neck and cuffs have rolled edges.